That fine Scottish sports journalist, Doug Gillon, wrote an article about Walter in January 2015; and here are several excerpts. In the Scottish Masters Cross-Country Championships at Kilmarnock, one of the “hardy stalwarts is Walter McCaskey, making his first appearance in the over-80 age group for which three men line up. 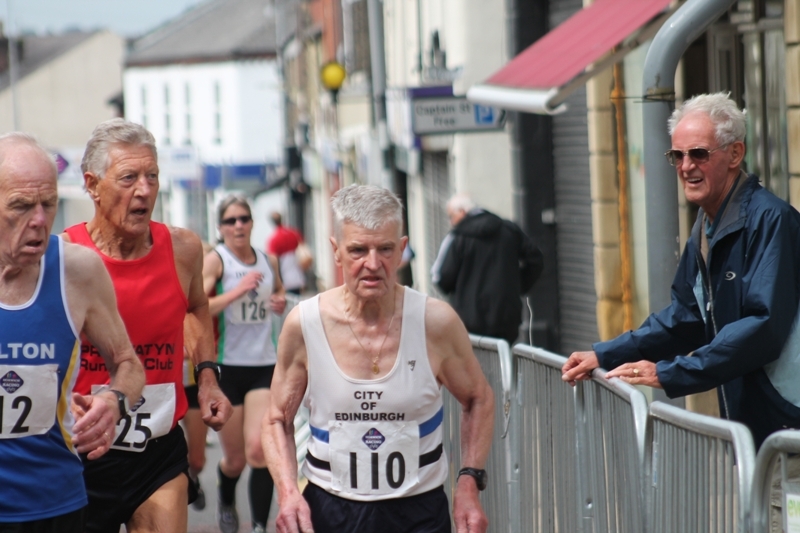 Today he defends the Scottish Masters title he won 12 months ago at Hawick, and he completed the 12k course of the Scottish National at Falkirk last year (first in his age group) in a very creditable 67.12. He was sixth in the British and Irish Masters International cross country at Nottingham in November, second Scot as they won team bronze. Walter McCaskey (born 11th August 1934). Club: City of Edinburgh A.C. I began running in 1982. It was at my daughter’s wedding and, after a few drinks, I promised to raise some money for charity by joining my brothers, who were training for the Edinburgh Youngers Tartan Marathon. Little did I know what I had let myself in for. After marathons at Aberdeen and Glasgow, in the 1984 Black Isle Marathon I came first M50. After setting my fastest time in the 1986 Glasgow event I did not improve, probably because I was doing so many races and using them as social events, just going away for long weekends. It was about this time that I joined EAC and started doing cross country. Alex McEwan got me thinking about how I was running. He told me that I had too much energy left at the finish of races! The next event I tried much harder and won gold at Aberdeen. I can say that the best races that come to mind are firstly the 2005 Scottish Masters XC Championships at Bellahouston Park, when I came in first M70 only two seconds in front of Bert McFall. It was a great contest and Bill McBrinn reckoned it was the finest contest of the day. The only thing I did not like about it was having to beat my friend Bert! Secondly, the following week I travelled to Bangor and came in first M70 in the British Masters XC Championships. The worst race was rushing to catch the bus in Glasgow to join the Scottish team! By the time I reached it I was really done in. I have only one ambition and that is to keep on running. As for my other activities, I bike to the gym and do some work on the rowing machine and the cross trainer. I do some speedwork on the treadmill and then finish with a little swim. My training is a mixture of road and grass running. I do hill reps in the park. Each week I run 15 to 20 miles and probably a little bit more when building up for a race. Running has made me a more responsible person, and given me time to think about other people and the good they do. By joining SVHC I gained one big family of friends.